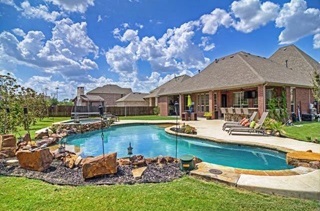 Trophy Club homes, located in North Texas, is a small affluent community nestled around golf courses designed by Ben Hogan, himself. This community boasts new, large luxury homes and three bedroom ranches to suit a variety of needs. Great local schools and close proximity to great shopping venues, makes this a place that many residents love to call home. Homes in Trophy Club are featured amongst awe inspiring natural beauty. Feel secure jogging, walking, or grilling out etc. in a town that takes pride in its excellent police, fire, and E.M.S. services. Enjoy a day of family fun in Trophy Club's recreational facilities, where you'll enjoy activities such as soccer, baseball, swimming, tennis, and more. Trophy Club features over 1,000 acres of parks. Spend the day boating or kayaking at Trophy Club Park, or enjoy a family day at Harmony Park, which features a state-of-the-art electronic play system that allows you play outdoors on three different gaming systems, or pamper your pooch at the Freedom Dog Park, which features dog amenities like canine classes, a shaded pavilion, doggie water fountains and more.